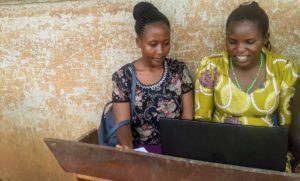 Through their extracurricular initiatives at Mahani Primary School, Building Tomorrow Fellows Lucky Natukunda and Namata Tendo are connecting teachers and students both socially and technologically. At Mahani Primary School in the Rwamwanja Refugee Settlement, Building Tomorrow Fellows Lucky Natukunda and Namata Tendo are spearheading two young initiatives to better connect students to each other and teachers to technological skills. 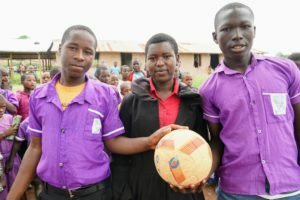 Congolese students Guard, Tantine, and Bahati (left to right) all participate in the Ball Project led by Fellow Lucky Natukunda at Mahani Primary School. The first initiative is harnessing the power of play through Building Tomorrow’s partnership with the Ball Project to promote soccer as a way to teach students valuable life skills such as discipline, teamwork, and goal-setting while also helping them to develop healthy lifestyles and attitudes through self-confidence, physical fitness, and appreciation of the outdoors. Started in February 2018 at the beginning of the new school year, Lucky and Namata have harnessed the game to teach communication skills alongside the values of sharing and teamwork to more than 120 students at Mahani Primary School. One of the students partaking in the soccer initiative is a young boy called Bahati from North Kivu. Having arrived in Uganda in June 2016 and started school at Mahani Primary School that same month, he enjoys playing soccer not just for the physical exercise it provides, but the emotional and social benefits as well. “When I reached this country, I really wanted to learn how to play so that I could play in a team here,” says Bahati. “But the game has also taught us to love other people and how to guide our friends.” He says the sport makes him feel more at home in Uganda, and the teamwork he practices helps him feel more connected to his fellow Ugandan and Congolese students, even when they are off the field and in the classroom. Bahati’s classmate, Guard, who also fled North Kivu in 2016 and enrolled at Mahani Primary School later that year, echoed Bahati’s appreciation of the technical soccer skills that the initiative has imparted such as kicking, passing, and guarding, but also noted that the sport has helped him to become more attentive generally. The second initiative that Lucky and Namata are leading at Mahani Primary School is called 5P: ICT Teachers Changemakers.” The 5 “P’s” are Proper Preparation to Prevent Poor Performance, and the initiative focuses on motivating and equipping teachers with technology skills that not only help them in the classroom, but can advance them professionally and personally as well. Already present at 6 of the 8 government schools at which the Fellows work, the initiative is introducing teachers to fundamental computing concepts, software, and skills through two classes each week that can improve their lives both inside and outside of the classroom. Because the Fellows live and work in communities like the Rwamwanja Refugee Settlement where the Mahani Primary School is located without access to electricity, they usually have to spend an entire day charging their two Building Tomorrow-provided laptops that they use for the lessons via solar energy. Upon arrival, they separate teachers into groups of 4-5 people so that they can share a laptop and practice their skills together. 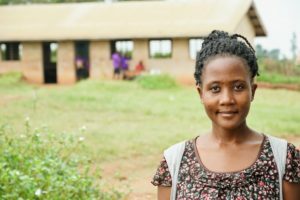 Clementina Mutoni, a Congolese teacher who also serves as a Building Tomorrow Community Education Volunteer (CEV) enrolling out-of-school children back in class, is one of the participants in the Fellows’ 5P initiative. She sees computing as a window to the world and to information, and also as a means to connect to her family that she left behind in the Democratic Republic of the Congo. Clementina appreciates that the girls see the lack of electricity as more of a hurdle than a roadblock, as she otherwise would not have access to these skills. “There is no technological infrastructure or electricity in this area,” describes Clementina. “It is like a happy accident, or luck, that I am able to learn these skills. That’s why the Fellow is called Lucky,” she jokes. Building Tomorrow Fellow Lucky Natukunda stands in the compound of Mahani Primary School, one of the four schools at which she works. For Halerimana Apollinaire, also a Congolese teacher serving as a Building Tomorrow CEV, the motivation for learning how to use a computer is more administrative. He hopes to have his own computer one day that will help him keep track of and easily share enrolment at the school, exam scores, and other important data. Like Clementina, he acknowledges the lengths to which the Fellows go to bring him the lessons and appreciates their efforts. And a dynamic duo they are! Lucky and Namata’s humble 5P initiative is challenging the idea that rural communities have to wait for technological education and pushing the boundaries of what IT education can look like in underserved areas like the Rwamwanja Refugee Settlement. They embody and leverage the entrepreneurial spirit and training imparted through the Building Tomorrow Thriving Schools Program and, combined with their soccer initiatives at schools like Mahani Primary School, are connecting the community not only each other, but to valuable skills. In partnership with Educate A Child, Building Tomorrow’s Thriving Schools Program is a community-centered initiative led by Building Tomorrow Fellows and teams of Community Education Volunteers aimed at providing primary-age students with access to an inclusive, quality education. As a core part of their curriculum, Fellows receive training to jumpstart and cultivate their own social initiatives and enterprises and innovate solutions for some of the most stubborn challenges confronting Uganda. To read more about our Thriving Schools Program and its changemakers working in hard-to-reach communities across rural Uganda, click here. [ii] “UNICEF Uganda Humanitarian Situation Report – May 2018,” 2.